Malaysian, male, aged 64, was appointed to the Board on 6 April 1984 as an Executive Director and has been the Managing Director of the Company since April 1988 till 29 June 2018 when he was redesignated as Executive Chairman. Tan Sri Francis studied at Kingston University in the United Kingdom, where he obtained a Bachelor of Science (Hons) Degree in Civil Engineering and was conferred an Honorary Doctorate of Engineering in 2004. In July 2014, Tan Sri Francis was conferred an Honorary Degree of Doctor of Laws from University of Nottingham. He became the Managing Director of YTL Corporation Berhad Group in 1988 which, under his stewardship, has grown from a single listed company into a global integrated infrastructure developer, encompassing multiple listed entities ie. YTL Corporation Berhad, YTL Power International Berhad, YTL Land & Development Berhad, YTL Hospitality REIT and Starhill Global REIT. He was the Managing Director of YTL Power International Berhad and YTL Land & Development Berhad which are listed on the Main Market of Bursa Malaysia Securities Berhad until 29 June 2018 when he was redesignated as Executive Chairman of these companies. He is the Executive Chairman and Managing Director of YTL e-Solutions Berhad. He is also the Executive Chairman of YTL Starhill Global REIT Management Limited, the manager of Starhill Global REIT, a vehicle listed on the Main Board of the Singapore Exchange Securities Trading Limited (SGX-ST). Tan Sri Francis is the Executive Chairman of YTL Cement Berhad and director of YTL Industries Berhad. He is the Chairman of private utilities corporations, Wessex Water Services Limited in England and Wales, and YTL PowerSeraya Pte Limited in Singapore. Tan Sri Francis is also an Independent Non-Executive Director of The Hong Kong and Shanghai Banking Corporation Limited, and is a director and Chief Executive Officer of Pintar Projek Sdn Bhd, the manager of YTL Hospitality REIT. He also sits on the board of trustees of YTL Foundation. He also serves on the board of directors of Suu Foundation, a humanitarian organisation committed to improving healthcare and education in Myanmar. He is a Founder Member of the Malaysian Business Council and The Capital Markets Advisory Council, member of The Nature Conservancy Asia Pacific Council, and the Asia Business Council, Trustee of the Asia Society and Chairman for South East Asia of the International Friends of the Louvre. He is also a member of the Advisory Council of London Business School, Wharton School and INSEAD. He is the first non-Italian board member of the historic Rome Opera House and helped fund its restoration to keep it from closing. He served as a member of the Barclays Asia-Pacific Advisory Committee from 2005 to 2012. Tan Sri Francis was made a board member of Global Child Forum by His Majesty King Carl XVI Gustaf in May 2016. In 2006, he was awarded the Commander of the Most Excellent Order of the British Empire (CBE) by Her Majesty Queen Elizabeth II, and received a prestigious professional accolade when made a Fellow of the Institute of Civil Engineers in London in 2008. He was the Primus Inter Pares Honouree of the 2010 Oslo Business for Peace Award, for his advocacy of socially responsible business ethics and practices. The Award was conferred by a panel of Nobel Laureates in Oslo, home of the Nobel Peace Prize. He also received the Corporate Social Responsibility Award at CNBC's 9th Asia Business Leaders Awards 2010. He received the Lifetime Achievement Award for Leadership in Regulated Industries at the 7th World Chinese Economic Summit held in London in 2015. He was also awarded the prestigious Muhammad Ali Celebrity Fight Night Award at the 2016 Celebrity Fight Night in Arizona. In 2017, he was honoured with the Kuala Lumpur Mayor's Award for Outstanding Contribution at the Kuala Lumpur Mayor Tourism Awards. This was in recognition of his efforts in the transformation of Kuala Lumpur into one of the top shopping and tourist destinations in the world. He was named CEO of the Year at the Asian Power Awards in 2017. The Japanese Government bestowed upon him the Order of the Rising Sun, Gold Rays with Rosette, in 2018. Malaysian, male, aged 61, was appointed to the Board on 24 June 1984 as an Executive Director. He has been the Deputy Managing Director of the Company till 29 June 2018 when he was redesignated as Managing Director of the Company. He graduated from Heriot-Watt University, Edinburgh, United Kingdom in 1981 with a Bachelor of Science (Hons) Degree in Building and was conferred an Honorary Degree of Doctor of the University in 2017. He attended the Advance Management Programme conducted by Wharton Business School, University of Pennsylvania in 1984. Dato' Yeoh is a Fellow of the Faculty of Building, United Kingdom as well as a Member of the Chartered Institute of Building (UK). He served as Deputy Managing Director of YTL Power International Berhad and Executive Director of YTL Land & Development Berhad, both listed on the Main Market of Bursa Malaysia Securities Berhad until 29 June 2018 when he was redesignated as Managing Director of YTL Land & Development Berhad and Executive Director of YTL Power International Berhad. Dato' Yeoh also sits on the boards of other public companies such as YTL Cement Berhad, YTL Industries Berhad and The Kuala Lumpur Performing Arts Centre, and private utilities corporations, Wessex Water Limited in England and Wales, YTL PowerSeraya Pte Limited in Singapore, as well as YTL Starhill Global REIT Management Limited, the manager of Starhill Global REIT, a vehicle listed on the Main Board of the Singapore Exchange Securities Trading Limited (SGX-ST). He is also an Executive Director of Pintar Projek Sdn Bhd, the manager of YTL Hospitality REIT. Malaysian, male, aged 70, was appointed to the Board on 30 September 2004 as an Independent Non-Executive Director. He is also a member of the Audit Committee and Nominating Committee. Dato' Cheong graduated from the University of Singapore with a Bachelor of Accountancy. He is a Chartered Accountant of Malaysian Institute of Accountants, a member of the Malaysian Institute of Certified Public Accountants, member of Malaysian Institute of Taxation and member of the Institute of Chartered Secretaries and Administrators. Dato' Cheong is also a Licensed Tax Agent and a Licensed Goods & Service Tax Agent. Dato' Cheong was the Executive Director and Partner of Coopers & Lybrand and upon its merger with Price Waterhouse was the Executive Director, Partner and Chairman of the Governance Board of PricewaterhouseCoopers until his retirement in December 2003. He is currently also a director of YTL Land & Development Berhad, YTL e-Solutions Berhad, Gromutual Berhad, Tanah Makmur Berhad and several private limited companies. Malaysian, female, aged 62, has been on the Board as an Executive Director since 24 June 1984. She graduated with a Bachelor of Art (Hons) Degree in Accounting. She did her Articleship at Leigh Carr and Partners, London and gained vast experience in accounting and management. She was responsible for the setting up of the Travel and Accounting Division of the YTL Group in December 1990. Dato' Yeoh Soo Min is currently responsible for the accounting and finance systems for the YTL Group. She is an Associate Fellow member of the Malaysian Institute of Management, Life Member of the Women's Institute of Management, Malaysia, and member of the Advisory Council for Action Learning, Asia School of Business. She is currently Honorary Fellow of the Governors of International Students House, London, and Sir Thomas Pope, Trinity College, University of Oxford, UK, and member of the Vice-Chancellor's Circle of University of Oxford, UK. She is also a Trustee of Yayasan Tuanku Fauziah and IJN Foundation. She also holds directorships in YTL Power International Berhad, a company listed on the Main Market of Bursa Malaysia Securities Berhad and YTL Industries Berhad. Malaysian, male, aged 59, was appointed to the Board on 19 June 1985 as an Executive Director. He obtained his Bachelor of Engineering (Hons) Civil & Structural Engineering Degree from the University of Bradford, United Kingdom in 1982. He is a member of the Faculty of Building, United Kingdom. In 2010, he was conferred an Honorary Doctor of Science degree by Aston University in the United Kingdom. Dato' Yeoh Seok Hong has vast experience in the construction industry, being the Executive Director responsible for the YTL Group construction division. He was the project director responsible for the development and the construction of the two Independent Power Producer power stations owned by YTL Power Generation Sdn Bhd. His other achievements include the construction of the Express Rail Link between the Kuala Lumpur International Airport and the Kuala Lumpur Sentral Station. He is also responsible for developing the power and utility businesses of the YTL Power International Berhad Group and the building of the fourth generation (4G) Worldwide Interoperability for Microwave Access (WiMAX) network by YTL Communications Sdn Bhd. He serves as Managing Director of YTL Power International Berhad and Executive Director of YTL Land & Development Berhad, both listed on the Main Market of Bursa Malaysia Securities Berhad. Dato' Yeoh Seok Hong also sits on the boards of other public companies such as YTL Cement Berhad and YTL Industries Berhad, and private utilities corporations, Wessex Water Limited and Wessex Water Services Limited in England and Wales and YTL PowerSeraya Pte Limited in Singapore. He also sits on the board of trustees of YTL Foundation. Malaysian, male, aged 58, was appointed to the Board on 19 June 1985 as an Executive Director. He graduated from University of Bradford, United Kingdom in 1983 with a Bachelor of Engineering (Hons) Civil & Structural Engineering Degree. Dato' Sri Michael Yeoh is primarily responsible for the YTL Group Manufacturing Division which activities involve cement manufacturing and other building material industries. He serves as an Executive Director of YTL Power International Berhad and YTL Land & Development Berhad, both listed on the Main Market of Bursa Malaysia Securities Berhad and Managing Director of YTL Cement Berhad. He also sits on the boards of other public companies such as YTL e-Solutions Berhad, YTL Cement Berhad, YTL Industries Berhad, and a private utilities corporation, YTL PowerSeraya Pte Limited in Singapore. Malaysian, female, aged 55, was appointed to the Board on 16 May 1996 as an Executive Director. She graduated with a Bachelor of Science (Hons) in Civil Engineering from Leeds University, United Kingdom in 1985. She started her career as the project director for the construction of the British High Commissioner's residence, Kuala Lumpur; the Design & Build of the National Art Gallery in Kuala Lumpur and the Selangor Medical Centre in Shah Alam. She was also in charge of a few turnkey projects such as the construction and completion of Yeoh Tiong Lay Plaza, Pahang Cement plant in Pahang and Slag Cement plants in Selangor and Johor. She heads the sales and marketing of the mobile internet of YTL Communications Sdn Bhd. She is also the purchasing director responsible for bulk purchases of building materials and related items for the construction, hotels and resorts, and property development divisions of the YTL Group. She is instrumental in the sales and marketing of cement and related products for YTL Cement Berhad and Perak-Hanjoong Simen Sdn Bhd. She was the Chairman of Cement and Concrete Association from year 2013 to 2015. She is also a director of YTL Power International Berhad, a company listed on the Main Market of Bursa Malaysia Securities Berhad, YTL e-Solutions Berhad and YTL Cement Berhad. She is actively engaged in community work and is currently President of the Federal Territory Kuala Lumpur Branch of the Girl Guides Association Malaysia, and member of the board of the World Scout Foundation. Malaysian, male, aged 53, was appointed to the Board on 22 June 1995 as an Executive Director. He graduated from King's College, University of London, with an LLB (Hons) and was subsequently called to the Bar at Gray's Inn, London in 1988. He was awarded Fellowship of King's College London in July 2014. Dato' Mark Yeoh joined YTL Group in 1989 and is presently the Executive Director responsible for the YTL Hotels and Resorts Division. In addition, he is also part of YTL Power's Mergers & Acquisitions Team and was involved in the acquisition of ElectraNet SA (Australia), Wessex Water Limited (UK), P.T. Jawa Power (Indonesia) and PowerSeraya Limited (Singapore). He serves as an Executive Director of YTL Power International Berhad and YTL Land & Development Berhad, both listed on the Main Market of Bursa Malaysia Securities Berhad. He is also a board member of YTL Cement Berhad and private utilities corporations, Wessex Water Limited and Wessex Water Services Limited in England and Wales, and YTL PowerSeraya Pte Limited in Singapore. He is also an Executive Director of Pintar Projek Sdn Bhd, the manager of YTL Hospitality REIT. Malaysian, male, aged 68, was appointed to the Board on 26 November 2015 as an Independent Non-Executive Director. He is also a member of the Audit Committee. Dato' Ahmad Fuaad holds a Bachelor of Arts (Hons) degree from the University of Malaya. He was attached with Wisma Putra, Ministry of Foreign Affairs as Malaysian Civil Service ("MCS") Officer in April 1973 before joining Malaysia Airlines in July 1973. While in Malaysia Airlines, Dato' Ahmad Fuaad served various posts and his last position was as the Managing Director. He was formerly a director of Lembaga Penggalakan Pelanchongan Malaysia, Malaysia Industry-Government Group for High Technology and Malaysia Airports Holdings Berhad. Currently, Dato' Ahmad Fuaad is a director of YTL e-Solutions Berhad, Hong Leong Capital Berhad and Pintar Projek Sdn Bhd, the manager of YTL Hospitality REIT. Malaysian, male, aged 83, was appointed to the Board on 31 March 2003 as an Independent Non-Executive Director. He is also the Chairman of the Audit Committee and a member of Nominating Committee. Mr Leslie Eu graduated with the degree of Bachelor of Commerce from the University College Dublin, Ireland in 1959. He was nominated by Bank Negara Malaysia to be one of the founding directors of Global Maritime Ventures Berhad to undertake the expansion and direct investment in the maritime industry in 1994. He has been in the shipping business for over 50 years and was the first Chief Executive Officer of Malaysian International Shipping Corporation Berhad from the company's inception in 1969 until his early retirement in 1985. Mr Leslie Eu was a board member of Lembaga Pelabuhan Kelang from 1970 to 1999 and is a Member Emeritus of the American Bureau of Shipping. He was appointed by the United Nations Conference on Trade and Development as one of 13 experts to assist developing nations in establishing their maritime fleets. Mr Leslie Eu presently serves on the boards of YTL Land & Development Berhad, a company listed on the Main Market of Bursa Malaysia Securites Berhad and YTL Cement Berhad. He is also a director of Pintar Projek Sdn Bhd, the manager of YTL Hospitality REIT. Malaysian, male, aged 64, was appointed to the Board on 20 October 1999 as an Executive Director. He graduated from the University of Birmingham in 1977 with a Bachelor of Science (Engineering Production) and a Bachelor of Commerce (Economics) Double Degree. He has extensive experience in banking and financial services, having been with Bumiputra Merchant Bankers Berhad from 1984 to 1994, holding the position of general manager immediately prior to his departure from the bank. Prior to joining YTL Corporation Berhad Group, he was, from November 1994 to February 1996, the general manager of Amanah Capital Partners Berhad (now known as MIDF Amanah Capital Berhad), a company which has interests in, inter alia, discount, money broking, unit trusts, finance and fund management operations. He currently also serves on the boards of YTL Power International Berhad which is listed on the Bursa Malaysia Securities Berhad and YTL e-Solutions Berhad. Malaysian, male, aged 60, was appointed to the Board on 1 December 2011 as an Independent Non-Executive Director. He is also the Chairman of the Nominating Committee. He graduated from the Association of Chartered Certified Accountants (ACCA) in the United Kingdom in 1982. He was admitted as associateship and fellowship of the association in 1993 and 1998 respectively. He served in various posts in The New Straits Times Press (M) Berhad since 1982 and was appointed as the Managing Director in 1999 till 2003. He joined Commerce Assurance Berhad (a licensed general insurance underwriter, now part of Allianz General Insurance Berhad) as Executive Director in 2003 and assumed the role of Chief Executive Officer from 2006 to 2007. Encik Faiz is presently a business entreprenuer in retail food and beverage. He also serves on the board of YTL Power International Berhad which is listed on the Main Market of Bursa Malaysia Securities Berhad. The late Tan Sri Dato' Seri (Dr) Yeoh Tiong Lay who is a deemed major shareholder of the Company, is the father of Tan Sri Dato' (Dr) Francis Yeoh Sock Ping, Dato' Yeoh Seok Kian, Dato' Yeoh Soo Min, Dato' Yeoh Seok Hong, Dato' Sri Michael Yeoh Sock Siong, Dato' Yeoh Soo Keng and Dato' Mark Yeoh Seok Kah. Save as disclosed herein, none of the Directorshas any family relationship with any director and/or major shareholder of the Company. None of the Directors has any conflict of interest with the Company. None of the Directors has been convicted of any offences within the past five (5) years. None of the Directors has been imposed with any public sanction or penalty by the relevant regulatory bodies during the financial year. 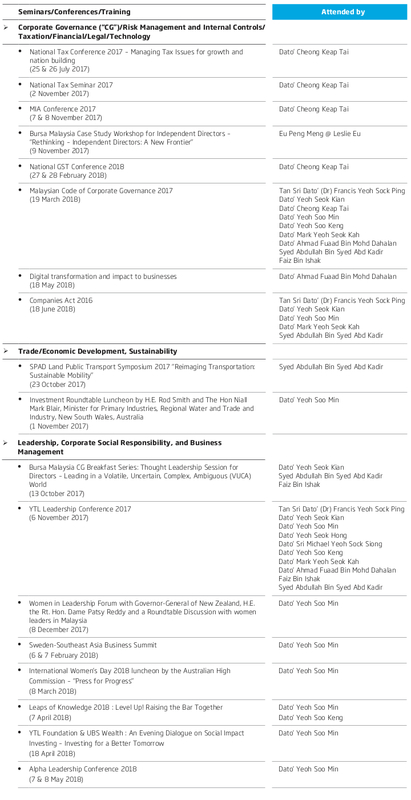 The Board Charter sets out the role, composition and responsibilities of the Board of Directors of YTL Corporation Berhad (the "Company"/"YTL Corp") (the "Board"). 2.1 The conduct of the Board is governed by the Memorandum and Articles of Association of the Company, and the laws, rules and regulations governing companies in Malaysia. 2.2 Save for specific corporate decisions that require approval of regulatory authorities or shareholders as stipulated in the Articles of Association of the Company, Companies Act, 1965, Bursa Malaysia Securities Berhad ("Bursa Securities") Main Market Listing Requirements ("Main LR") and other applicable rules and laws, the Board shall have full authority to make all decisions. 2.3 The Board shall also have the power to delegate specific functions and authority to its Committees, individual Directors, or the Management. (f) Reviewing the adequacy and integrity of the Group's management information and internal control systems. The Directors observe and adhere to the Code of Ethics for Company Directors established by the Companies Commission of Malaysia, which encompasses the formulation of corporate accountability standards in order to establish an ethical corporate environment. In the discharge of their responsibilities, the Directors have established functions which are reserved for the Board and those which are delegated to Management. Key matters reserved for the Board's approval include overall strategic direction, business expansion and restructuring plans, material acquisitions and disposals, expenditure over certain limits, issuance of new securities and capital alteration plans. 5.1 The Company is led and managed by an experienced Board with a wide and varied range of expertise to address and manage the complexity and scale of the Group's operations. This broad spectrum of skills and experience ensures the Group is under the guidance of an accountable and competent Board. The Articles of Association of the Company provides for a minimum of 3 Directors and a maximum of 20 Directors. 5.2 At any one time, at least 2 or 1/3, whichever is higher, of the Board members are Independent Directors. 5.3 Executive Directors have a direct responsibility for business operations whereas Non-Executive Directors have the necessary skill and experience to bring an independent judgment to bear on issues of strategy, performance and resources brought before the Board. The Executive Directors are collectively accountable for the running and management of the Group's operations and for ensuring that strategies are fully discussed and examined, and take account of the long-term interests of shareholders, employees, customers, suppliers and the many communities in which the Group conducts its business. 5.4 The Independent Directors provide independent judgment, experience and objectivity without being subordinated to operational considerations. They help to ensure that the interests of all shareholders, and not only the interests of a particular fraction or group, are taken into account by the Board and that the relevant issues are subjected to objective and impartial consideration by the Board. 6.1 There is a balance of power and authority between the Executive Chairman and Managing Director with a clear division of responsibility between the running of the Board and the Company's business respectively. The positions of Executive Chairman and Managing Director are separated and clearly defined and are held by separate members of the Board. (e) facilitating the effective contribution of Non-Executive Directors and ensuring constructive relations be maintained between Executive and Non-Executive Directors. (e) Keeping the Board informed of salient aspects and issues concerning the Group's operations. (d) Keeping the Board informed of salient aspects and issues concerning the Group's operations. Independent Non-Executive Directors play a leading role in these committees. Details of the membership and summary of the terms of reference of each committee appointed by the Board are published in the Company's annual report and/or website. 7.2 Each year, the Board, through its Nominating Committee, will review the effectiveness of the Board and Board Committees as well as the contribution by each individual Director and Board Committee. The Nominating Committee will also facilitate and determine the board induction and continuing education programmes to be provided for the Board in areas that would best strengthen their contributions to the Board. In addition to the Mandatory Accreditation Programme required by Bursa Securities for newly appointed Directors, Board members are encouraged to attend to briefings, conferences, seminar programmes and speaking engagements which the Nominating Committee or the Board members have collectively or individually considered as useful in discharging the Board's stewardship responsibilities. 9.1 The Board meets at least once every quarter to facilitate the discharge of their responsibilities. Members of Management who are not Directors may be invited to attend and speak at meetings on matters relating to their sphere of responsibility. 9.2 Any Director may participate at a Board meeting or Committee Meeting by way of teleconferencing or by means of other communication equipment in which event such Director shall be deemed to be physically present and taken into account in ascertaining the presence of a quorum at the meeting. 9.3 Management is responsible for providing the Board with the required information in an appropriate and timely manner. 9.4 A full agenda and Board papers are circulated to all Directors well in advance of each Board meeting. The Board papers include, amongst others, the financial results, minutes of previous meeting, Directors' circular resolutions passed, summary of securities dealings by Directors, Directors' general notices of disclosure of interests in contracts, property, offices etc. 9.5 Urgent matters that cannot wait until the next Board meeting may be dealt with by way of circulation of a Board resolution in writing. Where necessary and prudent, Directors may seek independent professional advice with the Chairman's prior consent, which will not be unreasonably withheld, as they individually or collectively consider necessary to fulfil their responsibilities and permit independent judgment in decision making, at the expense of the Company. (a) The Company aims to present a clear and balanced assessment of the Company's financial position and future prospects that extends to the interim and price-sensitive information and other relevant reports submitted to regulators. (b) The Board ensures that the financial statements are prepared so as to give a true and fair view of the current financial status of the Company in accordance with the approved accounting standards. The Board is assisted by the Audit Committee in overseeing the Group's financial reporting processes and quality of its financial reporting. (a) The Board has transparent arrangements for considering how financial reporting and internal control principles will be applied and for maintaining an appropriate relationship with the external auditors through its Audit Committee. (b) The Audit Committee also keeps under review the scope and results of the audit and its cost effectiveness as well as the independence and objectivity of the external auditors. The Company ensures that the external auditors do not supply a substantial volume of non-audit services to the Company. (c) Appointment of the external auditors is subject to approval of shareholders at general meetings. The external auditors have to retire during the Annual General Meeting of the Company every year and be re-appointed by shareholders for the ensuring year. (a) The Company has an internal audit function which critically reviews all aspects of the Company's activities and its internal controls. Comprehensive audits of the practices, procedures, expenditure and internal controls of all business units and subsidiaries are undertaken on a regular basis. The Head of Internal Audit has direct access to the Board through the Chairman of the Audit Committee. (b) The Board ensures the system of internal controls is reviewed on a regular basis. (c) The Audit Committee receives reports regarding the outcome of such reviews on a regular basis. 12.1 The Company regards the AGM as an important event in the corporate calendar of which all Directors should attend. 12.2 The Company regards the AGM as the principal forum for dialogue with shareholders and aims to ensure that the AGM provides an important opportunity for effective communication with, and constructive feedback from, the Company's shareholders. 12.3 The Chairman encourages active participation by the shareholders during the AGM. 12.4 The Chairman and where appropriate, the Managing Director, respond to shareholders' queries during the AGM. 13.1 The Board acknowledges the need for shareholders to be informed of all material business matters affecting the Company and as such adopts an open and transparent policy in respect of its relationship with its shareholders and investors. 13.2 The Company communicates information to shareholders and the investing community through announcements that are released to Bursa Securities. Such announcements include the quarterly financial results, material transactions and other developments relating to the Group requiring disclosure under the Main LR. 13.3 In addition to the published annual report sent to all shareholders and the quarterly financial results announced to Bursa Securities, shareholders and investors can access information pertaining to the Company and its activities from the Company's website. 13.4 While the Company endeavours to provide as much information as possible to its shareholders and stakeholders, it is mindful of the legal and regulatory framework governing the release of material and price-sensitive information. In the course of pursuing the vision and mission of the Company, the Board recognizes that no company can exist by maximizing shareholders value alone. In this regard, the needs and interests of other stakeholders are also taken into consideration. (a) The Board acknowledges that the employees are invaluable assets of the Company and play a vital role in achieving the vision and mission of the Company. (b) The Company adopts documented policies and procedures with respect to occupational safety and health with the objective of providing a safe and healthy working environment for all employees. In acknowledging the need to safeguard and minimize the impact to the environment in the course of achieving the Company's vision and mission, the Company adopts policies that help protect the environment and contribute towards sustainable development as well as supports initiatives on environmental issues. (a) The Board acknowledges that the Company should play a vital role in contributing towards the welfare of the community in which it operates. (b) The Company adopts policies and procedures that contribute towards responsible marketing and advertising of its products and services. (c) The Company supports charitable causes and initiatives on community development projects. 15.1 The Board appoints the Company Secretary, who plays an important advisory role, and ensures that the Company Secretary fulfills the functions for which he/she has been appointed. 15.3 The Company Secretary is a central source of information and advice to the Board and its Committees on issues relating to compliance with laws, rules, procedures and regulations affecting the Company. (a) disclosure of interests in securities. (b) disclosure of any conflict of interest in a transaction involving the Company. (c) prohibition of dealing in securities. (d) restrictions on disclosure of price-sensitive information. 15.5 The Company Secretary must keep abreast of, and inform the Board of current governance practices. 15.6 The Board members have unlimited access to the professional advice and services of the Company Secretary. The Board Charter will be periodically reviewed and updated in accordance with the needs of the Company and any new regulations that may have an impact on the discharge of the Board's responsibilities. The Board of Directors ("Board") of YTL Corporation Berhad ("YTL Corp" or "Company") remains firmly committed to ensuring an appropriate and sound system of corporate governance throughout the Company and its subsidiaries ("YTL Corp Group"). The YTL Corp Group has a long-standing commitment to corporate governance and protection of stakeholder value, which has been integral to the YTL Corp Group's achievements and strong financial profile to date. The YTL Corp Group's corporate governance structure is a fundamental part of the Board's responsibility to protect and enhance long-term shareholder value and the financial performance of the YTL Corp Group, whilst taking into account the interests of all stakeholders. In implementing its governance system and ensuring compliance with the Main Market Listing Requirements ("Listing Requirements") of Bursa Malaysia Securities Berhad ("Bursa Securities"), the Board has been guided by the principles and practices set out in the Malaysian Code on Corporate Governance ("Code") issued by the Securities Commission Malaysia. The new Code was issued in April 2017 and required companies to report their application of the practices in the new Code for financial years ending on or after 31 December 2017, making this the Company's first report prepared with reference to its compliance with the new Code. In November 2017, Bursa Securities issued amendments to the Listing Requirements which, amongst others, replaced the previous narrative statement on corporate governance with the requirement for an overview of the application of the principles of the Code and set out the prescribed format for the Corporate Governance Report ("CG Report") required to be issued in conjunction with the annual report. Therefore, an overview of the Board's implementation of the practices set out in the Code during the financial year ended 30 June 2018 is detailed in this statement, together with targeted timeframes for measures expected to be implemented in the near future, where applicable, and the Company's CG Report for the financial year ended 30 June 2018 is available below and has been released via the website of Bursa Securities at www.bursamalaysia.com in conjunction with the Annual Report. YTL Corp is led and managed by an experienced Board with a wide and varied range of expertise to address and manage the complexity and scale of the YTL Corp Group's operations. This broad spectrum of skills and experience ensures the YTL Corp Group is under the guidance of an accountable and competent Board. The Directors recognise the key role they play in charting the strategic direction, development and control of the YTL Corp Group. Overseeing the development and implementation of shareholder communications policies. The Board is led by the Chairman who is responsible for instilling good corporate governance practices, leadership and effectiveness of the Board. Following the passing away of the YTL Corp Group's founder and Executive Chairman, Tan Sri Dato' Seri (Dr) Yeoh Tiong Lay, in October 2017, the Nominating Committee undertook an assessment of the needs of the Board in appointing a new chairman. In June 2018, the Board approved the re-designations of Tan Sri Dato' (Dr) Francis Yeoh Sock Ping, who was redesignated as the Executive Chairman, from Managing Director previously, and Dato' Yeoh Seok Kian, who was re-designated as the Managing Director, from Deputy Managing Director previously. There is a balance of power, authority and accountability between the Executive Chairman and the Managing Director with a clear division of responsibility between the running of the Board and the Company's business respectively. The positions of Executive Chairman and Managing Director are separate and clearly defined, and are held by different members of the Board. The Managing Director is responsible for, amongst others, overseeing the day-to-day running of the business, implementation of Board policies and strategies and making of operational decisions, serving as the conduit between the Board and the Management in ensuring the success of the Company's governance and management functions, ensuring effective communication with shareholders and relevant stakeholders, providing strong leadership, i.e., effectively communicating a vision, management philosophy and business strategy to employees, and keeping the Board informed of salient aspects and issues concerning the Group's operations. The Managing Director and Executive Directors are accountable to the Board for the profitability and development of the YTL Corp Group, consistent with the primary aim of enhancing longterm shareholder value. The Independent Non-Executive Directors have the experience and business acumen necessary to carry sufficient weight in the Board's decisions and the presence of these Independent Non-Executive Directors brings an additional element of balance to the Board as they do not participate in the day-to-day running of the YTL Corp Group. The roles of Executive and Non-Executive Directors are differentiated, both having fiduciary duties towards shareholders. Executive Directors have a direct responsibility for business operations whereas Non-Executive Directors have the necessary skill and experience to bring an independent judgment to bear on issues of strategy, performance and resources brought before the Board. The Executive Directors are collectively accountable for the running and management of the YTL Corp Group's operations and for ensuring that strategies are fully discussed and examined, and take account of the long-term interests of shareholders, employees, customers, suppliers and the many communities in which the YTL Corp Group conducts its business. In the discharge of their responsibilities, the Directors have established functions which are reserved for the Board and those which are delegated to management. Key matters reserved for the Board's approval include overall strategic direction, business expansion and restructuring plans, material acquisitions and disposals, expenditure over certain limits, issuance of new securities and capital alteration plans. Further information on authorisation procedures, authority levels and other key processes can also be found in the Statement on Risk Management & Internal Control set out in the Annual Report. The Board believes sustainability is integral to the long-term success of the YTL Corp Group. Further information on the YTL Corp Group's sustainability activities can be found in YTL Corp's Sustainability Report 2018, a separate report published in conjunction with the Annual Report. Board meetings are scheduled with due notice in advance at least 5 times in a year in order to review and approve the annual and interim financial results. Additional meetings may also be convened on an ad-hoc basis when significant issues arise relating to the YTL Corp Group and when necessary to review the progress of its operating subsidiaries in achieving their strategic goals. The Board met 5 times during the financial year ended 30 June 2018. The Directors have full and unrestricted access to all information pertaining to the YTL Corp Group's business and affairs to enable them to discharge their duties. At least one week prior to each Board meeting, all Directors receive the agenda together with a comprehensive set of Board papers encompassing qualitative and quantitative information relevant to the business of the meeting. This allows the Directors to obtain further explanations or clarifications, where necessary, in order to be properly briefed before each meeting. Board papers are presented in a consistent, concise and comprehensive format, and include, where relevant to the proposal put forward for the Board's deliberation, approval or knowledge, progress reports on the YTL Corp Group's operations and detailed information on corporate proposals, major fundraising exercises and significant acquisitions and disposals. Where necessary or prudent, professional advisers may be on hand to provide further information and respond directly to Directors' queries. In order to maintain confidentiality, Board papers on issues that are deemed to be price-sensitive may be handed out to Directors during the Board meeting. The Company Secretary ensures that Board procedures are adhered to at all times during meetings and advises the Board on matters including corporate governance issues and the Directors' responsibilities in complying with relevant legislation and regulations. The Company Secretary works very closely with Management for timely and appropriate information, which will then be passed on to the Directors. In accordance with the Board's procedures, deliberations and conclusions in Board meetings are recorded by the Company Secretary, who ensures that accurate and proper records of the proceedings of Board meetings and resolutions passed are recorded and kept in the statutory register at the registered office of the Company. The Board's functions are governed and regulated by its Charter, the Constitution of the Company and the various applicable legislation, Listing Requirements and other regulations and codes. The Board's Charter was formalised during the financial year ended 30 June 2014 and a copy can be found under the "Governance" section on the Company's website at www.ytl.com. The Board Charter clearly sets out the role and responsibilities of the Board, Board committees, Directors and Management and the issues and decisions reserved for the Board. The Board Charter is reviewed and updated periodically when necessary. The Directors observe and adhere to the Code of Ethics for Company Directors established by the Companies Commission of Malaysia, which encompasses the formulation of corporate accountability standards in order to establish an ethical corporate environment. YTL Corp has an established track record for good governance and ethical conduct, and is in the process of updating and formalising the code of conduct for all employees of its group of companies in a consolidated employee handbook, also sets out a whistleblowing policy and procedures. The Board currently has 12 Directors, comprising 8 executive members and 4 non-executive members, all 4 of whom are independent. The Independent Directors comprise 33.3% of the Board. This provides an effective check and balance in the functioning of the Board, and complies with the Listing Requirements, which require one-third of the Board to be independent. The Directors are cognisant of the recommendation in the Code for the Board to comprise a majority of independent directors, and will assess the composition and size of the Board on an ongoing basis to ensure the needs of the Company are met. The Board is of the view that the current Independent Non-Executive Directors have the experience and business acumen necessary to carry sufficient weight in the Board's decisions, and act in the best interests of the shareholders. There are currently two Independent Non-Executive Directors, Dato' Cheong Keap Tai and Mr Eu Peng Meng @ Leslie Eu, who both have served on the Board for a period exceeding the nineyear term limit recommended in the Code. In accordance with current practice, approval through a vote of all shareholders via the single-tier voting process will continue to be sought at the forthcoming thirty-fifth Annual General Meeting ("AGM") of YTL Corp for Dato' Cheong Keap Tai and Mr Eu Peng Meng @ Leslie Eu to continue to serve as Independent Non-Executive Directors. Further information on the review and assessment process can be found in the Nominating Committee Statement, whilst details of the resolution, together with the rationale for approval sought, can be found in the Notice of Annual General Meeting in the Annual Report. In accordance with the Company's Constitution, at least one-third of the Directors are required to retire from office at each Annual General Meeting ("AGM") and may offer themselves for re-election by rotation. Directors who are appointed by the Board during the financial year are subject to re-election by shareholders at the next AGM held following their appointments. The names of Directors seeking re-election at the forthcoming AGM are disclosed in the Notice of Annual General Meeting, which can be found in the Annual Report. The details of the Directors can be found in the Profile of the Board of Directors set out in the Annual Report and this information is also available under the "Governance" section on the Company's website at www.ytl.com. The Nominating Committee is chaired by an Independent Non-Executive Director and is responsible for assessing suitable candidates for appointment to the Board for approval, taking into account the required mix of skills, diversity, experience and expertise of members of the Board before submitting its recommendation to the Board for decision. Nevertheless, in identifying future candidates, the Board will also endeavour to utilise independent sources including external human resources consultants and specialised databases, as appropriate. As the Board's overriding aim is to maintain a strong and effective Board, it seeks to ensure that all appointments are made on merit, taking into account the collective balance of elements such as skills, experience, age, gender, ethnicity, background and perspective. The Board recognises the importance of encouraging and developing female talent at all levels. Currently there are two female directors on the Board comprising 16.7% of the Board and, therefore, the Board has not met the target of 30% women directors set out in the Code. However, the Directors understand the importance of having a diverse Board to leverage on varying perspectives, experience and expertise required to achieve effective stewardship and management. The Board intends to continue its current approach to support diversity in all aspects while at the same time seeking Board members of the highest calibre, and with the necessary strength, experience and skills to meet the needs of the YTL Corp Group. Annual evaluation of the Board as a whole, Board Committees and the individual Directors is carried out by the Nominating Committee. The evaluation carried out during the financial year under review involved an annual assessment of the effectiveness of each individual Director and the Board as a whole with the objectives of assessing whether the Board and the Directors had effectively performed its/their roles and fulfilled its/their responsibilities, and devoted sufficient time commitment to the Company's affairs, in addition to recommending areas for improvement. The assessment exercise was facilitated by the Company Secretary and took the form of completion of questionnaires/ evaluation forms comprising a Board and Nominating Committee Effectiveness Evaluation Form, Individual Director Performance Evaluation Form, Independent Directors' Evaluation Form, Audit Committee Effectiveness Evaluation Form and Audit Committee Members Evaluation Form. As recommended in the Code, the Board will endeavour to utilise independent experts to facilitate the evaluation process, as and when appropriate. Further information on the activities of the Nominating Committee can be found in the Nominating Committee Statement set out in the Annual Report. This information is also available under the "Governance" section on the Company's website at www.ytl.com. Directors' remuneration is decided in line with the objective recommended by the Code to determine the remuneration for Directors so as to attract, retain, motivate and incentivise Directors of the necessary calibre to lead the YTL Corp Group successfully. In general, the remuneration of the Directors is reviewed against the performance of the individual and the YTL Corp Group. The Executive Directors' remuneration consists of basic salary, other emoluments and other customary benefits as appropriate to a senior management member. The component parts of remuneration are structured so as to link rewards to performance. Directors do not participate in decisions regarding their own remuneration packages and Directors' fees must be approved by shareholders at the AGM. Details of the Directors' remuneration categorised into appropriate components can be found in Note 7 in the Notes to the Financial Statements in the Annual Report. Meanwhile, as regards the remuneration of the YTL Corp Group's senior management team, the Board is of the view that the disclosure of these details would not be in the best interests of YTL Corp Group due to confidentiality and the competitive nature of the industries in which the YTL Corp Group operates, as well as for business and personal security reasons. In accordance with the Listing Requirements, each member of the Board holds not more than five directorships in public listed companies. This ensures that their commitment, resources and time are focused on the affairs of the YTL Corp Group thereby enabling them to discharge their duties effectively. Presently, each Board member is required to assess (via the annual assessment process) whether he/she devotes the necessary time and energy to fulfilling his/her commitments to the Company. The Board recognises that an individual's capacity for work varies depending on various factors that weigh very much on his/her own assessment. Hence, having rigid protocols in place before any new directorships may be accepted is not practical. Each Board member is also expected to inform the Board whenever he/she is appointed as an officer of a corporation. The details of each Director's attendance of Board meetings can be found in the Profile of the Board of Directors whilst details of the training programmes attended during the year under review are disclosed in the Nominating Committee Statement in the Annual Report. This information is also available under the "Governance" section on the Company's website at www.ytl.com. The Directors are responsible for ensuring that financial statements are drawn up in accordance with the Listing Requirements, Financial Reporting Standards and the requirements of the Companies Act 2016 in Malaysia. The Statement of Directors' Responsibilities made pursuant to Section 248-249 of the Companies Act 2016 is set out in the Annual Report. In presenting the financial statements, the Company has used appropriate accounting policies, consistently applied and supported by reasonable and prudent judgments and estimates, to present a true and fair assessment of the Company's position and prospects. Interim financial reports were reviewed by the Audit Committee and approved by the Board prior to release to Bursa Securities. The Company has in place an Audit Committee which comprises 3 Independent Non-Executive Directors, in compliance with the Listing Requirements and the Code, namely Mr. Eu Peng Meng @ Leslie Eu, Dato' Cheong Keap Tai and Dato' Ahmad Fuaad Bin Mohd Dahalan. The Chairman of the Audit Committee is Mr Eu Peng Meng @ Leslie Eu, in accordance with the recommendations of the Code that the chairman of the audit committee should not be the chairman of the Board. The Audit Committee holds quarterly meetings to review matters including the YTL Corp Group's financial reporting, the audit plans for the financial year and recurrent related party transactions, as well as to deliberate the findings of the internal and external auditors. The Audit Committee met 5 times during the financial year ended 30 June 2018. Full details of the composition and a summary of the work carried out by the Audit Committee during the financial year can be found in the Audit Committee Report set out in the Annual Report. This information and the terms of reference of the Audit Committee are available under the "Governance" section on the Company's website at www.ytl.com. The Audit Committee has established formal and professional arrangements for maintaining an appropriate relationship with the Company's external auditors, Messrs HLB Ler Lum ("HLB"). The external auditors also attend each AGM in order to address clarifications sought pertaining to the audited financial statements by shareholders. During the financial year under review, the Terms of Reference of the Audit Committee were updated to include the establishment of policies to assess the suitability, objectivity and independence of external auditors. It is intended that these policies, which will also include a requirement that a former key audit partner must observe a cooling-off period of two years before being appointed as a member of the Audit Committee, will be implemented within the next one year. The Board acknowledges its overall responsibility for maintaining a sound system of risk management and internal control to safeguard the investment of its shareholders and the YTL Corp Group's assets, and that these controls are designed to provide reasonable, but not absolute, assurance against the risk of occurrence of material errors, fraud or losses. Details of the YTL Corp Group's system of risk management and internal control are contained in the Statement on Risk Management & Internal Control and the Audit Committee Report as set out in the Annual Report. YTL Corp's internal audit function is undertaken by its Internal Audit department ("YTLIA"), which reports directly to the Audit Committee. The Head of YTLIA, Mr Choong Hon Chow, is a member of the Malaysian Institute of Accountants and a fellow member of the Association of Chartered Certified Accountants (ACCA) UK. He started his career with the external audit division of a large public accounting firm before moving on to the internal audit profession in public listed companies and gained valuable and extensive internal audit experiences covering many areas of diversified commercial businesses and activities. He has a total of 35 years of internal and external audit experience.  Presenting audit findings to the Board for consideration. Further details of the YTL Corp Group's internal audit function are contained in the Statement on Risk Management & Internal Control and the Audit Committee Report as set out in the Annual Report. The YTL Corp Group values dialogue with investors and constantly strives to improve transparency by maintaining channels of communication with shareholders and investors that enable the Board to convey information about performance, corporate strategy and other matters affecting stakeholders' interests. The Board believes that a constructive and effective investor relationship is essential in enhancing shareholder value and recognises the importance of timely dissemination of information to shareholders. Accordingly, the Board ensures that shareholders are kept wellinformed of any major development of the YTL Corp Group. Such information is communicated through the Annual Report, the various disclosures and announcements to Bursa Securities, including quarterly and annual results, and corporate websites. Corporate information, annual financial results, governance information, business reviews and future plans are disseminated through the Annual Report, whilst current corporate developments are communicated via the Company's corporate website at www.ytl.com and the YTL Corp Group's community website at www.ytlcommunity.com, in addition to prescribed information, including its interim financial results, announcements, circulars, prospectuses and notices, which is released through the official website of Bursa Securities. The Executive Chairman, Managing Director and the Executive Directors meet with analysts, institutional shareholders and investors throughout the year not only to promote the dissemination of the YTL Corp Group's financial results but to provide updates on strategies and new developments to ensure better understanding of the YTL Corp Group's operations and activities. Presentations based on permissible disclosures are made to explain the YTL Corp Group's performance and major development programs. Whilst efforts are made to provide as much information as possible to its shareholders and stakeholders, the Directors are cognisant of the legal and regulatory framework governing the release of material and sensitive information so as to not mislead its shareholders. Therefore, the information that is price-sensitive or that may be regarded as undisclosed material information about the YTL Corp Group is not disclosed to any party until after the prescribed announcement to Bursa Securities has been made. The AGM is the principal forum for dialogue with shareholders. The Board provides opportunities for shareholders to raise questions pertaining to issues in the Annual Report, corporate developments in the YTL Corp Group, the resolutions being proposed and the business of the YTL Corp Group in general at every general meeting of the Company. The Notice of the AGM and a circular to shareholders in relation to the renewal of the Company's share buy-back and recurrent related party transactions mandates, if applicable, are sent to shareholders at least 28 days prior to the AGM in accordance with the Code, which also meets the criteria of the Listing Requirements and Companies Act 2016, which require the Notice of AGM to be sent 21 days prior to the AGM. This provides shareholders with sufficient time to review the YTL Corp Group's financial and operational performance for the financial year and to fully evaluate new resolutions being proposed to make informed voting decisions at the AGM. The Executive Chairman, Managing Director and Executive Directors take the opportunity to present a comprehensive review of the progress and performance of the YTL Corp Group and provide appropriate answers in response to shareholders' questions during the meeting, thereby ensuring a high level of accountability, transparency and identification with the YTL Corp Group's business operations, strategy and goals. The Directors are mindful of the recommendation under the Code that all directors must attend general meetings and fully appreciate the need for their attendance at all such meetings. Extraordinary general meetings are held as and when required to seek shareholders' approval. The Executive Chairman, Managing Director and Executive Directors take the opportunity to fully explain the rationale for proposals put forth for approval and the implications of such proposals for the Company and to reply to shareholders' questions. The rights of shareholders, including the right to demand for a poll, are found in the Constitution of the Company. At the 34th AGM of the Company, held on 12 December 2017, the resolutions put forth for shareholders' approval were voted on by way of a poll. 1. Provide assistance to the Board of Directors ("Board") in fulfilling its fiduciary responsibilities relating to the corporate accounting and practices for YTL Corporation Berhad and its subsidiaries ("Group"). 2. Assist to improve the Company and the Group's business efficiency, the quality of the accounting function, the system of internal controls and the audit function to strengthen the confidence of the public in the Company's and the Group's reported results. 4. Establish policies and procedures to assess the suitability, objectivity and independence of the external auditors. 9. Instill discipline and control to reduce incidence of fraud. 1. The Committee shall be appointed by the Board from amongst their number and shall comprise no fewer than three (3) members, all of whom must be non-executive directors, with a majority of them being Independent Directors. (c) fulfils such other requirements as prescribed or approved by Bursa Malaysia Securities Berhad ("Bursa Securities"). 4. The members of the Committee shall elect a Chairman from amongst their number who shall be an Independent Director. The Chairman of the Committee shall not be the Chairman of the Board. (g) Review any significant audit findings, reservations, difficulties encountered or material weaknesses reported by the external auditors. (c) Review any significant audit findings, reservations, difficulties encountered or material weaknesses reported by the internal auditors. (a) Review any related party transaction and conflict of interest situation that may arise within the Company/Group and any related parties outside the Company/Group including any transaction, procedure or course of conduct that raises questions of management integrity. (a) Verify allocation of share options to the eligible employees pursuant to the criteria set out in the By-Laws of the ESOS in accordance to the Main LR. (b) Promptly report to Bursa Securities on any matter reported by it to the Board of the Company which has not been satisfactorily resolved resulting in a breach of the Main LR. 2. The Committee shall meet at least five (5) times a year, although additional meetings may be called at any time at the discretion of the Chairman of the Committee. An agenda shall be sent to all members of the Committee and any other persons who may be required/invited to attend. All meetings to review the quarterly financial results and annual financial statements, shall be held prior to such quarterly financial results and annual financial statements being presented to the Board for approval. 4. The external auditors have the right to appear and be heard at any meeting of the Committee and shall appear before the Committee when required to do so by the Committee. 5. The Committee may invite any Board member or any member of the management within the Company/Group whom the Committee thinks fit to attend its meetings to assist in resolving and clarifying matters raised in audit reports. First, second and third quarters of the quarterly results for the financial year ended 30 June 2018 at the Audit Committee meetings held 21 November 2017, 21 February 2018 and 23 May 2018, respectively. The Financial Reports were fairly presented in conformity with the relevant accounting standards in all material aspects. the profiles of the audit engagement team which enabled the Audit Committee to assess their qualifications, expertise, resources, and independence, as well as the effectiveness of the audit process. The external auditors also confirmed their independence in each of the reports presented to the Audit Committee. (c) Had discussions with the external auditors twice during the financial year, namely on 20 September 2017 and 23 May 2018, without the presence of management, to discuss matters concerning the audit and financial statements. The Audit Committee also enquired about the assistance and co-operation given by management to the external auditors. (a) Reviewed the proposed amendments to its TOR to include enhancements to its oversight role as introduced by the changes to the Main LR and practices recommended in the Malaysian Code of Corporate Governance, prior to approval of the Board of Directors. (a) Reviewed the verification of share options allocation to the eligible employees approved by the options committee in May 2018 and concurred that the allocation under the ESOS complied with the criteria set out in the By-Laws of the ESOS. The objective of the Internal Audit ("IA") is to help management evaluate the effectiveness and efficiency of the internal control systems. The IA is part of the Company and the Group's governance system, and according to the Malaysian Code of Corporate Governance, the IA is in charge of supervising internal control activities. IA's goal is to focus mainly on risk-based audits related to operations and compliance that are aligned with the risks of the Company and the Group to ensure that the relevant controls addressing those risks are reviewed. Compliance with relevant laws, regulations and contractual obligations. 2. Conducted scheduled and special internal audit engagements, focusing primarily on the effectiveness of internal controls and recommending improvements where necessary. 4. Presented significant audit findings and areas for improvements raised by the IA to the Audit Committee for consideration on the recommended corrective measures together with the management's response. Costs amounting to RM2,653,814 were incurred in relation to the internal audit function for the financial year ended 30 June 2018. The NC assists the Board of Directors of YTL Corporation Berhad (the "Company") ("Board") in discharging its responsibilities by overseeing the selection and assessment of Directors to ensure that the composition of the Board meets the needs of the Company and its subsidiaries ("YTL Corp Group"). The NC is responsible for considering and making recommendations to the Board candidates for directorship when the need arises such as to fill a vacancy arising from resignation or retirement or to close any skills, competencies, experience or diversity gap that has been identified. Candidates may be proposed by the Managing Director or any Director or shareholder and must fulfil the requirements prescribed under the relevant laws and regulations for appointment as director. In assessing the suitability of a candidate, the NC will take into consideration a number of factors including but not limited to the candidate's skills, knowledge, expertise, competence and experience, time commitment, character, professionalism and integrity. For the position of independent non-executive director, the NC will evaluate the candidate's ability to discharge such responsibilities as expected from an independent nonexecutive director. In accordance with Article 84 of the Company's Constitution ("Article 84"), Directors are to be elected at every annual general meeting when one-third of the Directors longest in office shall retire, subject always to the requirement that all Directors shall retire from office once at least in each three years, and if eligible, may offer themselves for re-election. Although the 70-year age limit for directors had been abolished under the Companies Act, 2016, directors who were appointed by the members at the last annual general meeting pursuant to Section 129 of the Companies Act, 1965 ("Section 129 CA65") to hold office until the conclusion of the next annual general meeting, are required to be re-appointed in order to continue in office. If re-appointed, these directors will then be subject to retirement by rotation in accordance with the Company's Constitution. The Board, save for the members who had abstained from deliberations on their own reelection, supported the NC's views and recommends that shareholders vote in favour of the resolutions for their re-election at the forthcoming AGM. As part of the annual assessment of Directors, an assessment of independence was conducted on the INED. In addition to the criteria for independence prescribed in the Bursa Malaysia Securities Berhad Main Market Listing Requirements and Practice Note 13, the INED were assessed on their ability and commitment to continue to bring independent and objective judgment to board deliberations. The Board is of the view that there are significant advantages to be gained from the INED who have served on the Board for more than 12 years as they possess greater insights and knowledge of the businesses, operations and growth strategies of the YTL Corp Group. Furthermore, the ability of a director to serve effectively as an independent director is very much a function of his calibre, qualification, experience and personal qualities, particularly of his integrity and objectivity in discharging his responsibilities in good faith in the best interest of the company and his duty to vigilantly safeguard the interests of the shareholders of the company. The Board, save for Eu Peng Meng @ Leslie Eu and Dato' Cheong Keap Tai who had abstained from deliberations on the matter, is satisfied with the skills, contributions and independent judgment that Eu Peng Meng @ Leslie Eu and Dato' Cheong Keap Tai, who have served for 12 years or more, bring to the Board. For these reasons, the Board, save for Eu Peng Meng @ Leslie Eu and Dato' Cheong Keap Tai, recommends and supports the resolutions for their continuing in office as INED of the Company which will be tabled for shareholders' approval to be sought via the single-tier voting process at the forthcoming AGM. In May 2018, the annual assessment of the effectiveness of the Board as a whole, the Board Committees and individual Directors was carried out with the objectives of assessing whether the Board and the Board Committees, as well as the Directors have effectively performed its/ their roles and fulfilled its/theirs responsibilities, and devoted sufficient time commitment to the Company's affairs; and to recommend areas for improvement. The assessment exercise was facilitated by the Company Secretary and took the form of completion of questionnaires/evaluation forms. In evaluating the effectiveness of the Board, several areas were reviewed including the composition, degree of independence, right mix of expertise, experience and skills, quality of information and decision making, and boardroom activities. Board Committees were assessed on their composition, expertise, and whether their functions and responsibilities were effectively discharged in accordance with their respective terms of reference. Results of the assessment were summarised and discussed at the NC meeting held in June 2018 and reported to the Board by the NC. No evident weakness or shortcoming was identified which require mitigating measure. The Board and the Board Committees continue to operate effectively and that the performance of the Directors and the time commitment in discharging their duties as Directors of the Company for the year ended 30 June 2018 were satisfactory. These results form the basis of the NC's recommendations to the Board for the re-election of Directors at the AGM. In June 2018, the NC deliberated on the succession in the boardroom following the demise of the late Founder of YTL group, Tan Sri Dato' Seri (Dr) Yeoh Tiong Lay. The NC evaluated candidates best matched to the roles required and recommended the re-designations of Tan Sri Dato' (Dr) Francis Yeoh Sock Ping to the role of Executive Chairman from Managing Director previously, and Dato' Yeoh Seok Kian, to Managing Director, from Deputy Managing Director previously. The NC Statement was reviewed by the NC prior to its recommendation to the Board for approval for inclusion in 2018 Annual Report. As the Board's overriding aim is to maintain a strong and effective Board, it seeks to ensure that all appointments are made on merit, taking into account the collective balance of elements such as skills, experience, age, gender, ethnicity, background and perspective. The Board recognises the importance of encouraging and developing female talent at all levels. Currently, two or 25% of the Company's Executive Directors are women and they make up 17% of the full Board. Although it has not set any specific measurable objectives, the Board intends to continue its current approach to diversity in all aspects while at the same time seeking Board members of the highest calibre, and with the necessary strength, experience and skills to meet the needs of the Company. Upon joining the Board, a newly appointed Director will be given an induction pack containing the Company's annual report, Constitution, and schedule of meetings of the Board and Committee (if the Director is also a Committee member) which will serve as an initial introduction to the YTL Corp Group as well as an ongoing reference. 1.1 To provide assistance to the Board of Directors ("Board") in overseeing the selection and assessment of Directors to ensure that the Board composition meets the need of YTL Corporation Berhad and its subsidiaries ("Group"). 2.4 In the event that the number of members is reduced below three (3), the Board shall appoint such new members as may be required as soon as practicable provided that the composition of the Committee shall meet the criteria set out in Clause 2.1 above. 3.4 have access to the advice and services of the Company Secretary. 4.2 To recommend to the Board suitable candidates for appointments, the re-appointments/re-election of Directors to the Board and any removals, and appointment of members of Board Committee established by the Board. In making its recommendation, the Committee should consider and assess the candidates' character, skills, knowledge, expertise and experience, professionalism, integrity, competence, commitment, contribution and time to effectively discharge his/her role as a director, and in the case of candidates for the position of independent non-executive directors, to evaluate the candidates' ability to discharge such responsibility/functions as expected from independent non-executive directors. 4.7 Establish a policy formalising Board's approach to boardroom diversity and ensure disclosure in the Annual Report its gender diversity policies. 5.1 The quorum for each meeting shall be two (2) members of the Committee including the Chairman. No business shall be transacted at any meeting of the Committee unless the quorum is present. The meeting of the Committee shall be governed by the provisions of the Company's Articles of Association relating to Board meetings unless otherwise provided for in this Terms of Reference. 5.3 The Committee may at its discretion and as necessary, invite any Board member or any member of the Management within the Company/Group whom the Committee thinks fit to attend its meetings to carry out the Committee's responsibilities. 5.4 The Committee shall meet at least once a year, although additional meetings may be called at any time at the discretion of the Chairman of the Committee. An agenda shall be sent to all members of the Committee and any other persons who may be required/invited to attend. 6.3 Minutes of the Committee's meetings will be made available to all Board members. A summary of significant matters and resolutions will be reported to the Board by the Committee. YTL Corporation Berhad (herein after referred to as "YTL") operates in the UK through several UK legal entities primarily across the Water and Hotel sectors. As a result of the Group's operational structures and the different divisions involved, not all UK entities are held by a single UK Holding company. Having said this, each company adopts the same philosophy and ensures that all its activities are of the highest legal and ethical standards. This Tax Strategy for the year ended 30 June 2017 is provided in compliance with the requirements of paragraphs 16(2) and 19(2), Schedule 19 Finance Act 2016 and covers all YTL entities resident in the UK as listed in the Group's annual accounts, referred to as the "UK Group" in this policy. The UK Group's approach to tax is fully aligned with YTL's overall objectives. The UK Group seeks to comply with the spirit and letter of UK tax legislation and claims all tax reliefs and allowances it is entitled to. The UK Group will consider reasonable tax planning opportunities which are in line with its risk appetite. As a general rule, the UK Group does not enter into complicated structures nor engages in any aggressive or artificial tax planning, as the UK Group does not believe it is the correct thing to do. Due to the size and complexity of the UK tax system, tax is a complicated area and uncertainties will arise. Consistent with other business areas, the UK Group will seek external advice when required. The Finance Director for each member of the UK Group is ultimately responsible for the tax strategy and engages with relevant individuals across the UK Group to ensure the tax strategy is implemented and monitored. Board oversight over each member of the UK Group's tax policy is exercised by Board and the Audit Committee where one exists. Due to the nature of the sectors YTL operates in the UK, the UK Group incurs significant capital expenditure. Consequently, obtaining tax relief on capital expenditure is a key factor affecting the UK Group. Other factors such as changes in tax legislation or changes in interpretations may also impact the amount of tax due by members of the UK Group. The UK Group adopts a risk averse and cautious approach to tax. In addition, tax is included as part of the UK Group's risk assessment framework. The overall risk framework is monitored by members of the UK Group with regular updates provided to the relevant Board. The UK Group has an open, regular and professional dialogue with all departments across HMRC. As part of its Large Business Directorate, HMRC has carried out a risk assessment for most members of the UK Group. The outcome of these risk reviews has always resulted in those entities being treated as low risk by HMRC. The UK Group is keen to maintain this low risk status in the long term. Members of the UK Group outside of the HMRC large Business directorate have the same objective. All members of the UK Group believe that its approach to tax and early engagement with HMRC on any area of uncertainty are significant factors in maintaining this low risk rating. Relevant members of the UK Group will also engage with HMRC on industry wide matters through its membership of industry bodies such as Water UK. e. Employees of the YTL Group are not permitted to endorse any political act, activity and/or event or political donation using the YTL Group's name, reputation and/or connections. 6.7 Where it is inappropriate to decline the offer of a gratification (i.e. when meeting with an individual of a certain religion/culture who may take offence), the gratification may be accepted so long as it is declared and surrendered to the employee's immediate supervisor and/or head of department, who will assess the relevant circumstances and take the necessary steps, including returning the gratification on the employee's behalf, where appropriate. 9.3 In the event that any employee has a reasonable suspicion of money laundering activities being conducted as part of the YTL Group's business, employees are expected to alert their immediate manager or supervision to the same. 10.1 Employees cannot distribute non-YTL Group related materials during their working hours and on the YTL Group's premises. 11.1 The YTL Group respects and is committed to the protection of employee's personal information and privacy. The Personal Data Protection Notice issued to employees explains how the YTL Group collects and handles employee information in accordance with the Malaysian Personal Data Protection Act 2010.